In November of last year I made the venture outside of NYC for an event that has occurred a few times a year for the last seven years: Ladies Weekend. It is a weekend my girlfriends from college set aside to celebrate a special occasion, a birthday or just the simple fact that we were all able to find time off. Ladies Weekends always involve the same sacred activities. Wearing pajamas all day. Watching marathons of reality TV and insisting that we hate Tyra Banks. Reading trashy tabloids because we must always know what Britney and Kendra are doing. Vegging out all day leads to evenings of fabulous dinners with endless glasses of wine, followed by hitting the bars for an absurd amount of drinks and flirting. We’ve done birthday parties with Donald Trump and Pam Anderson, drag shows in DuPont Circle, beaches in Punta Cana, martinis and celeb-spotting (Hello, Tyson Beckford) in Manhattan, and I won’t go into detail about the fun one can have with white T-shirts and markers in Happy Valley (a.k.a. Penn State). But this Ladies Weekend was different. It was early on Sunday morning, when I woke up and realized that Ladies Weekend, as I know it, was gone for good. The newest addition to Ladies Weekend. First off, it was early. Secondly I didn’t have a hangover. And a familiar voice echoed through the house. I made my way into the living room where I found my girlfriends, and what followed was a morning was filled with red hair, tickles and giggles… and not because I finally convinced Prince Harry to come home with me. This marks the first time I’ve ever done karaoke sober. Over the last seven years, our Ladies Weekends morphed from random, loud and crazy nights into lovely bridal showers, weddings and baby showers. Holly was the first to walk down the aisle, and then she had Jackson, and since that weekend has also welcomed Baby Natalie. Sandy, too, got married and now has her first little one on the way. Kimmy got married this past summer. On this weekend, there was no wine, out of respect for our two preggos. There were no late nights – running around with Jackson tired us all out. There was no flirting and getting boys to buy us drinks, though Jackson was happy to share his sippy cup. And yet, it was still Ladies Weekend. When it’s all said and done, we are still four girlfriends from college who were happy to find time amongst our busy schedules of work, babies, husbands, family, bills and errands to get together, talk about boys, gossip, laugh, look at pictures, and watch marathons of Top Model. I know many other groups of girlfriends do Ladies Weekends. And many will agree that it doesn’t matter where you go or what you do. It’s just a weekend to enjoy the all the reasons we became friends in the first place. So with this column, I happily induct a new member into “The Ladies” – Elmo. Because he makes Jackson smile, which gives us a very happy Mommy Holly, and that is the #1 rule of Ladies Weekends. I think we need to find a way to incorporate this man into every Ladies Weekend. 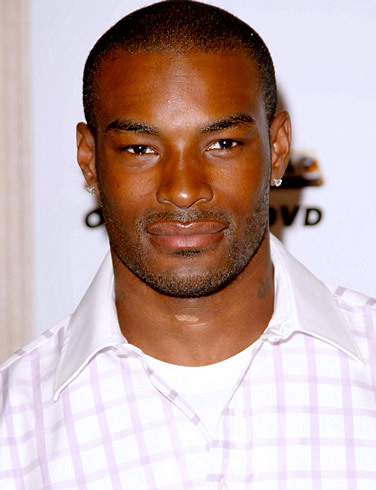 The world needs more Tyson Beckford... at least my world does! Elmo, you are now welcome to our future Ladies Weekends. The next one will be in a few weeks to welcome Baby Logan. Please come prepared with tabloids, chips and salsa, an NKOTB blanket, and your best smeye-zing for Tyra. And because none of my ladies will be pregnant (that I know of), I’ll bring the wine! See you in a few weeks, Ladies! P.S. Prince Harry and Tyson Beckford, you both are still invited to join us as well! P.S.S. Ladies, can we officially replace Tyra with RuPaul? I think we can agree that Drag Race is far more entertaining. This entry was posted in Weekly Columns and tagged elmo, girlfriends, girls weekend, ladies weekend, tabloids, tyra banks, tyson beckford. Bookmark the permalink. 3 Responses to The Intruder. Ladies Weekend will never be the same! I have to say I am man enough to admit having slept with said NKOTB blanket years ago! HA HA! Thanks, Stan! And I bet you have missed it every night since then. Perhaps you should also join us for the next Ladies Weekend so that you can be reacquainted with it! I never had a NKOTB blanket, but Elmo was my favorite when I was a kid. I had a similar type of hang out with my friends years ago, and now it is almost impossible to get the six of us together at the same time. We had our crazy nights that sometimes lasted until it was no longer night. My friends have different agendas, and some are apparently too busy to return a call. It’s good that you can still see these people, no matter what you are going to do, they will be there. Keep up the writing. I like your style.